Ditch the store-bought canned pumpkin and make it yourself instead! 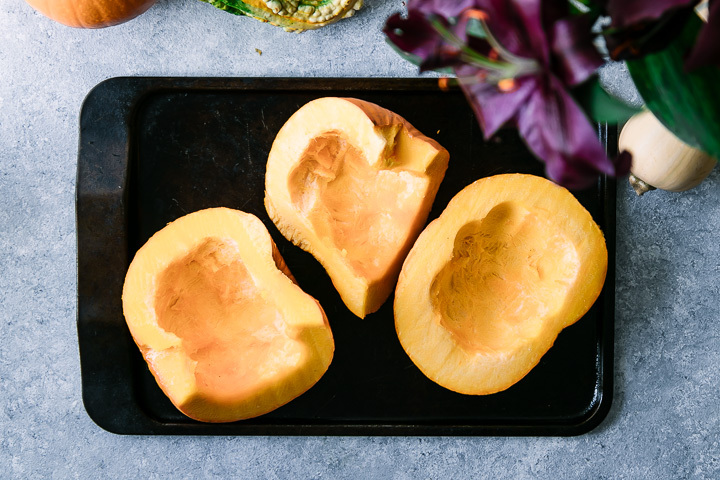 Making homemade pumpkin puree is simple both in the oven or in a pressure cooker like an Instant Pot. A simple make ahead recipes to stock up on pumpkin puree for fall. In our quest to live a more sustainable lifestyle, we’ve made meal planning a habit, transitioned to eco-friendly kitchen tools, and started truly eating with the seasons. But one of the biggest ways that we’ve made an impact on our zero waste kitchen goal is by making homemade sauces, dips, dressings, and other staples that can be easily made at home. And one of those ways is to make our own homemade pumpkin puree! 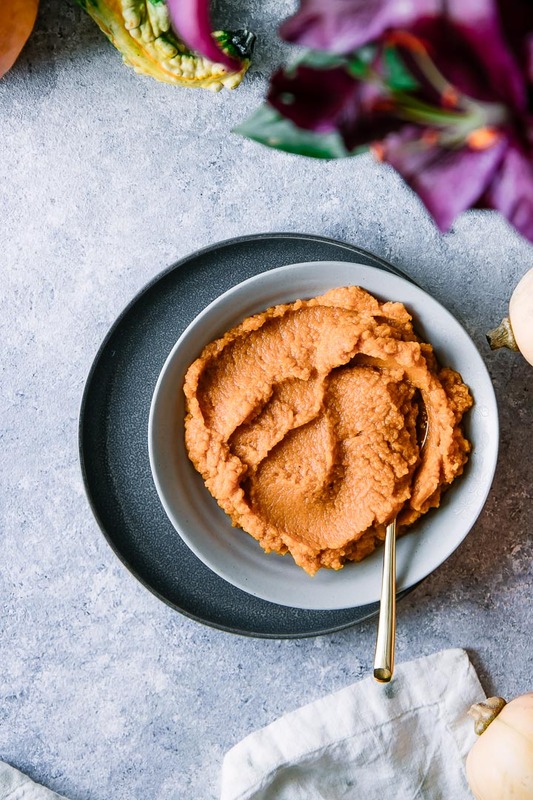 Most of us stock up on cans of pumpkin puree in the fall and before Thanksgiving, but did you know that pumpkin puree is actually really easy to make? It’s also a great recipe to freeze and eat throughout the winter in pies and other sweets. 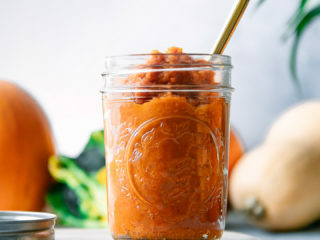 So ditch the cans of pumpkins and instead make your puree from scratch! Because those pumpkins they sell at the store are for more than decoration, they actually taste delicious too. 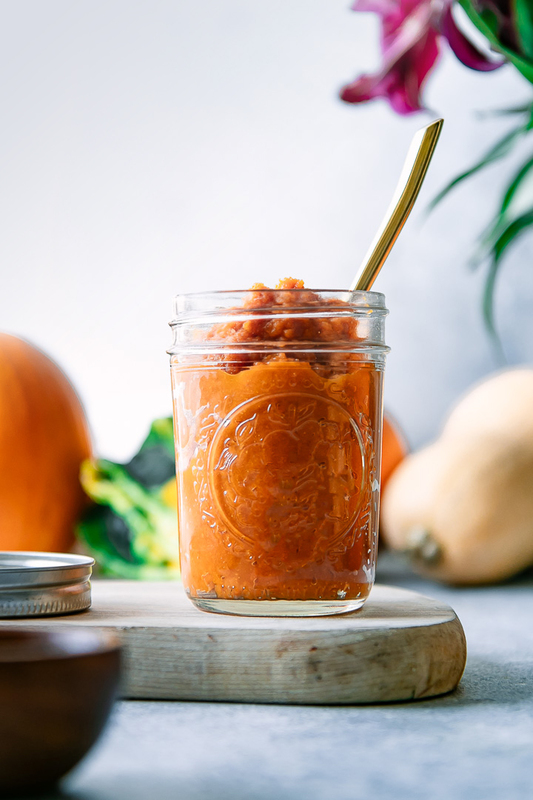 Ready to learn to make Homemade Pumpkin Puree in the oven or Instant Pot? Let’s do it! What are the best pumpkins for pumpkin puree? Other honorable mentions: acorn squash and butternut squash. Yes, many “pumpkin” purees are actually made from squash and not pumpkin. Who knew! To make pumpkin puree in the oven cut your pumpkin(s) in half and remove seeds. Place them face down on a wax paper-lined baking sheet and roast at 375 F (190 C) for 45 to 60 minutes, or until the flesh is soft and can be speared easily with a fork and when it starts to separate from the skin. Let pumpkin cool, then remove the skin and pulse the flesh in a food processor, blender, or with a handheld immersion blender. 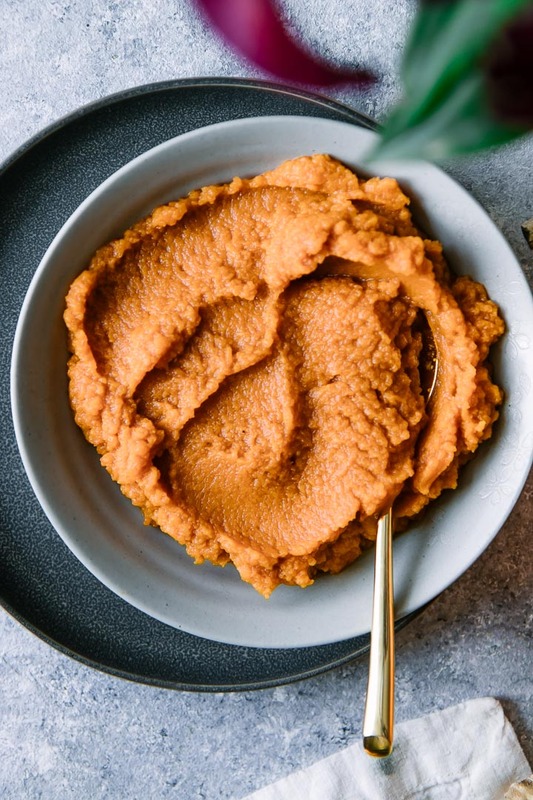 If the puree has a thick, watery consistency that means the pumpkin is still holding a lot of water, see instructions for removing excess water below. 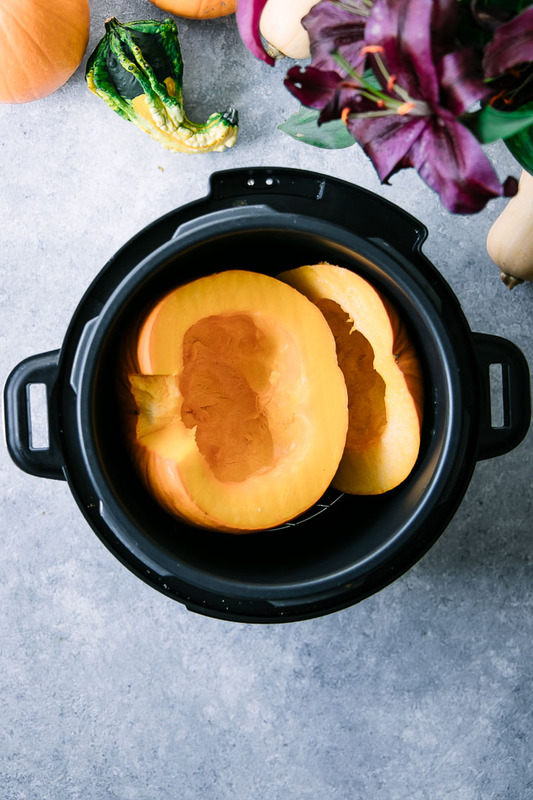 To make pumpkin puree in a pressure cooker (like an Instant Pot or Crock Pot), cut medium sized pumpkin (3-4 pounds) in half and remove seeds. Place inside pressure cooker on the wire rack to allow water beneath the pumpkin to steam and to make sure pumpkin skin does not burn. Add 2 cups of water and cook on high pressure for 15 to 20 minutes, depending on how hard your pumpkin flesh is (longer for harder flesh). When pressure cooker is done and pressure is released, use a fork to test the softness of pumpkin. If it’s still touch and fork does not easily spear through, cook for five minutes more on high pressure. Place a large mesh strainer over a bowl with a cheesecloth under it. Place puree in strainer and then press puree with a spoon to release water. Let sit for 30-60 minutes to allow water to drain. Heat puree in a pan over medium-low heat to “cook out” excess water, about 10 minutes. Then let sit for 30-60 minutes to promote even more drying. Pumpkin puree can be stored in an airtight container for up to one week in the refrigerator. It can also be frozen for up to one month* and then thawed in the refrigerator and used in your favorite pies, cookies, pancakes, or oatmeal. *Pumpkin puree may be stored longer, but for the freshest taste I suggest about one month. But if you do freeze it longer, let me know how it turns out and I can update this post with your feedback. Simple kitchen sauce tools: a food processor, handheld blender, or handheld immersion blender work well to puree pumpkins after roasting. I also like glass containers for storing puree. Responsibly-sourced spices: making a pumpkin pie or cookies? Food tastes extra delicious when you know ingredients are fair trade and sustainably sources. Try making pumpkin pie spices from brands like Frontier or Oakland Spice Shop’s online store, two of my personal favorites. I hope you found this pumpkin puree tutorial helpful! For more homemade sauces check out our Homemade Maple Bourbon Cranberry Sauce and Homemade Carrot Top Pesto recipes, both from-scratch takes on traditional store-bought sauces. 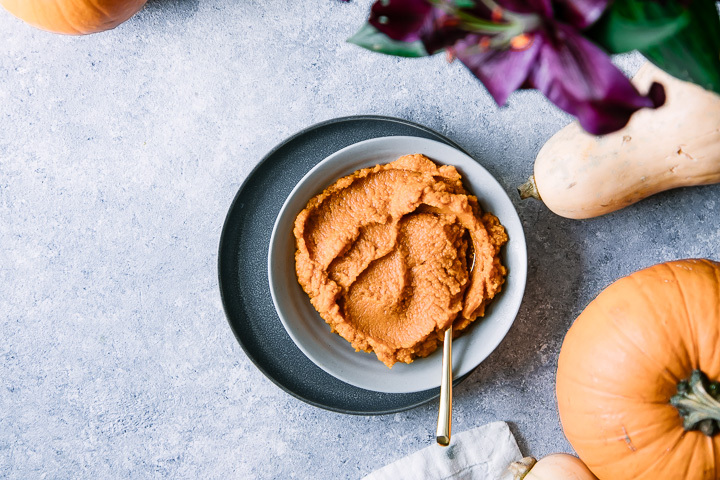 Did you make this Homemade Pumpkin Puree recipe? Leave a comment below and rate the recipe to let us know how it turned out. Save this recipe for later by pinning to your favorite fall Pinterest board and make sure to tag me on Fork in the Road’s Instagram to show me your salad creations! Ditch the store-bought canned pumpkin and make it yourself instead! Making homemade pumpkin puree is simple both in the oven or in a pressure cooker like an Instant Pot. A simple make ahead recipes to stock up on pumpkin puree for fall! Cut pumpkin in half and remove seeds. Place them face down on a wax paper-lined baking sheet and roast for 45 to 60 minutes, or until the flesh is soft and can be speared easily with a fork and when it starts to separate from the skin. Remove and let pumpkin cool, then remove the skin and pulse the flesh in a food processor, blender, or with a handheld immersion blender. If the puree has a thick, watery consistency that means the pumpkin is still holding a lot of water. Drain by pressing into a cheesecloth lined strainer and then let sit for up to 60 minutes. Cut pumpkin in half and remove seeds. Place inside pressure cooker on the wire rack to allow water beneath the pumpkin to steam and to make sure pumpkin skin does not burn. Add 2 cups of water to pot. Cook on high pressure for 15 to 20 minutes, depending on how hard your pumpkin flesh is (longer for harder flesh). When pressure cooker is done and pressure is released, use a fork to test the softness of pumpkin. If it’s still touch and fork does not easily spear through, cook for five minutes more on high pressure. When the pumpkin is done, let cool and then scrape flesh from the skin. The flesh will hold a lot of water, drain by pressing into a cheesecloth lined strainer and then let sit for up to 60 minutes. Nutrition: Pumpkins are a good source of potassium, vitamin E, and thiamin and are an excellent source of vitamin A. They are rich in carotenoids alpha-carotene and beta-carotene, phytonutrients that play a role in cell health and may reduce risk of heart disease. I love make pumpkin puree at home but i have to admit that i buy it a lot too. I’ve never made it in the instant pot and i just asked for one for christmas so I’ll try it in there too. thanks. I tried this in my new instant pot. I think I put in too much water but I let it sit out like you suggested and eventually it dried out. I put it in my oatmeal this morning, it was just like from the can. Thanks! I’m glad it worked out for you! When I first got my Instant Pot everything was experimental and it took a few times cooking with it to understand how much water to use when steaming and using the pressure cooking function.